The initiative aims to more effectively coordinate and communicate Banking Commission activities in the MENA region and meet increasing demands for premium trade finance information and up-to-date policy and market intelligence. “Facilitating trade, promoting economic development and enhancing the business environment are shared goals of ICC and the Dubai Chamber. 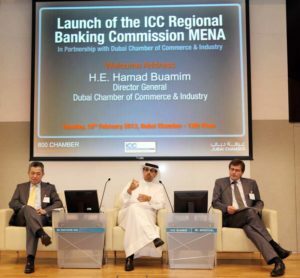 This is the reason why we have aligned to form this strategic partnership, to facilitate trade in the MENA region and strengthen the commission’s reputation as the banking industry’s most reputable and reliable provider of market intelligence,” said Kah Chye Tan, Chair, ICC Banking Commission. With over 600 members the Banking Commission is ICC’s largest commission. The Regional Banking Commission initiative will effectuate a better understanding of regional needs in terms of policy advocacy. It will also extend the reach of ICC banking rules and related services including ICC rules and guidelines on documentary credits, UCP 600 – the most successful privately drafted rules for trade ever developed – and forthcoming Bank Payment Obligation rules on supply chain finance. Marking the occasion, a regional commission launch conference was held at the Dubai Chamber attracting more than 150 high profile bankers, senior financial lawyers and banking sector professionals. The event concluded with the signing of a memorandum of understanding between ICC and the Dubai Chamber that aims to foster cooperation in areas including trade finance promotion, private sector development and capacity building of businesses in the MENA region. The agreement sets out multiple areas of cooperation that aim to leverage the ICC-Dubai Chamber partnership to strengthen the Banking Commission’s outreach at regional level and to facilitate the organization of conferences and workshops on best-practice implementation of topics such as trade finance, supply chain financing, banking regulation and dispute resolution in trade finance. Dubai is an established regional hub for the Middle East and a gateway to Africa for international trade, banking and finance, making it a strategic choice for the location of the ICC Regional Banking Commission MENA which hopes to be a forerunner for other ICC regional banking commissions. The MENA Regional Banking Commission will be led by Lakshmanan Sankaran, Deputy General Manager and Head of Operations and Trade Finance at Commercial Bank of Dubai. Other efforts by ICC to strengthen its presence in the region include a first annual conference on International Arbitration in the MENA region. The conference will reflect the region’s changing and challenging perceptions on international arbitration and it is set to take place in Dubai 15-17 April 2013.